This home-style Italian cucina in Belmont pays tribute to Dante de Magistris' grandmother's hearty cooking. 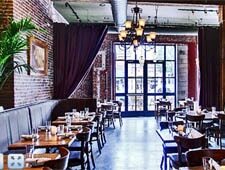 : Dante de Magistris (owner of Cambridge's dante) opened this authentic Italian restaurant in an old Belmont firehouse just down the street from where he grew up. He runs the restaurant with two of his brothers, Damian and Filippo. The family recipes are culled from his grandmother's kitchen; look for traditional offerings like Bolognese tagliatelle or a simple pasta dish of tomato basil. Favorites include Sicilian roast chicken with lemon-caper sauce, veal scaloppine with prosciutto, grilled rack of lamb with eggplant caponata, and a soul-warming escarole swimming in an earthy pork broth. The well-thought-out wine list has a mostly Italian bent. Portions are generous and can be served family-style for larger parties. The hazelnut chocolate mousse cake should not be missed. Family portraits grace the exposed brick walls, and the homey atmosphere extends to the tables, with Dante and his brothers often stopping by to chat.